Tanja Šljivar was born in Banjaluka, SFR Yugoslavia in 1988. She holds both BA and MA degree in dramaturgy at the Faculty of drama arts in Belgrade, as well as MA degree in Applied theater studies in Giessen, Germany. She wrote full length plays How much is Pate?, Scratching or How my grandmother killed herself, We are the ones our parents warned us about, But the city has protected me, All adventurous women do, Regime of Love and short play Stillborn, Self-sacrified and Europe-The Death of a Saleswoman which were published, publicly read and produced in professional theaters in Bosnia and Herzegovina(Bosnian National Theater Zenica), Croatia, Serbia(National Theater Užice, Atelje 212 Belgrade), Albania, Spain, Poland, Austria, Germany(Deutsches Theater Berlin, Schauspiel Stuttgart, Theater Dortmund, Theater Paderborn). She also writes short stories, radio plays, screenplays for short films and theater-theory texts. She co-wrote the script for the full length fiction film The Celts, directed by Milica Tomović, which is currently in post-production phase. She won several awards for her playwriting, most recently the prestigious Sterija award for the best contemporary play in Serbia, MESS market co-production award for All adveturous women do in Bosnia, as well as the nomination for the Retzhoferdramapreis 2017 for the same play, in Austria. Her plays have been translated into some 10 languages. 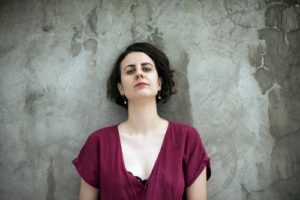 She has been a guest of writing residencies IHAG in Graz, Austria, Museums Quartier 21 in Vienna, Austria, and Prishtina has no river in Prishtina, Kosovo and in 2019 she will be guest of Reading Balkans in Split, Croatia and KulturKontakt, Vienna, Austria.